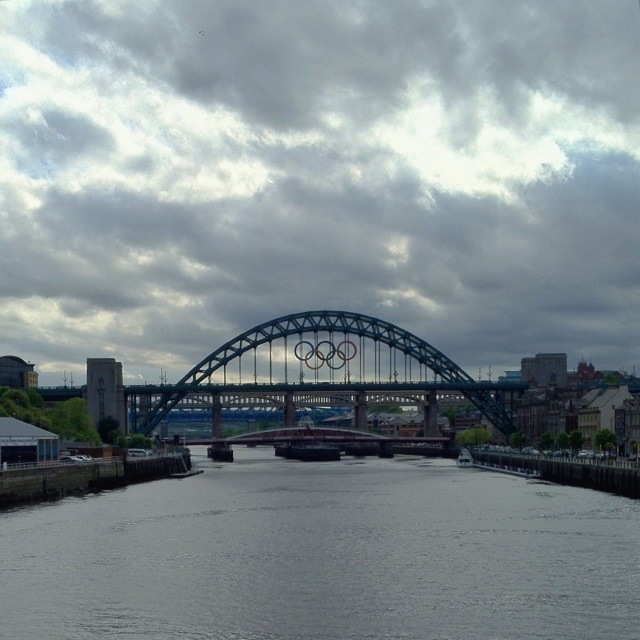 As Olympic preparations continue apace, the country’s biggest metal Olympic rings have been clamped to the Tyne Bridge to celebrate Newcastle’s status as one of the host cities. They look really quite smart. They are the correct colours, of course, though the contrast with the bright sky in this photo makes that hard to see. At first glance, from a distance, they didn’t look much different in size to the ones at St Pancras. But closer up, it’s clear that they really are quite huge: 25m wide, in fact, 50% bigger than the ones on The Mound in Edinburgh! This 1,686th post was filed under: Photo-a-day 2012, Architecture, Art, Bridges, Newcastle-upon-Tyne, Olympics, Sport.